I am going to be very unoriginal and say “Pride & Prejudice.” I love everything about Austen’s novel and will re-read it every few years forever. Easy peasy. #14 on my list was to Apply for a New Job. See yesterday’s post for how that went. I was content to happy in my old job, so although I applied for part-time work occasionally (the library or B&N) I wasn’t ever serious about looking for a new job. 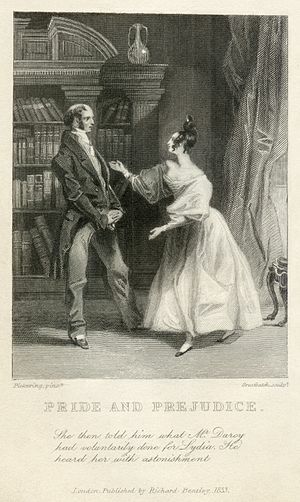 This entry was posted in About Book Blogging, General Book Talk and tagged 19th Century novels, Austen, Jane Austen, lists, Mr. Darcy, Pride & Prejudice. Bookmark the permalink. I haven’t read P&P yet. After finishing Jane Eyre, I decided that P&P should be the next classic I read.